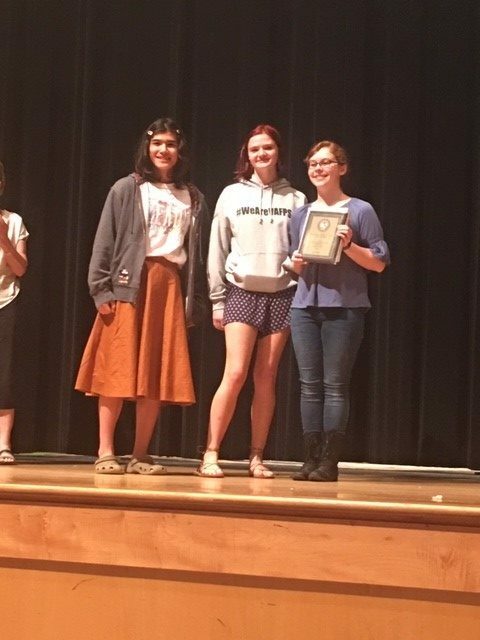 This past weekend, Maggie Walker’s Future Problem Solving team of Kyra Murphy (’21-Henrico), Tejas Muthusamy (’21-Henrico), Ellie Sabalewski (’21-Chesterfield), and Caroline Rucker (’21-Powhatan) took first place in the Virginia State Team Competition, winning a berth in the International Competition. They will be traveling to The University of Massachusetts, Amherst to represent Virginia in June. Additionally, the FPS team of April Smith (’19-Henrico), Liza Craig (’20-Richmond), Isabelle Giorgis (’20-Hanover), and Gabrielle O’Sickey (’20-Powhatan) won first place in the Action Plan Presentation. 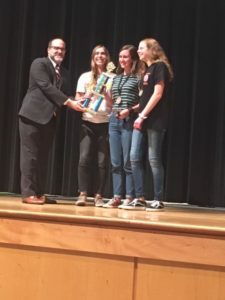 The Future Problem Solving Program organizes academic competitions in which students apply critical thinking and problem-solving skills to hypothetical future situations. The program looks at current technological, geopolitical, and societal trends and projects those trends 20–30 years into the future in order to train students to develop solutions to the challenges they may face as adults. The Future Problem Solvers team at Maggie Walker is sponsored by Mr. Ed Coleman. Congratulations to the teams and Mr. Coleman!